The Chicago Riot will be featured on ABC-7's "190 North," which will air at 10:35 p.m. Sunday, Jan. 9. The Riot also hosts the Omaha Vipers at 7 p.m. at the Odeum Sports and Expo Center in Villa Park. Don't miss out! 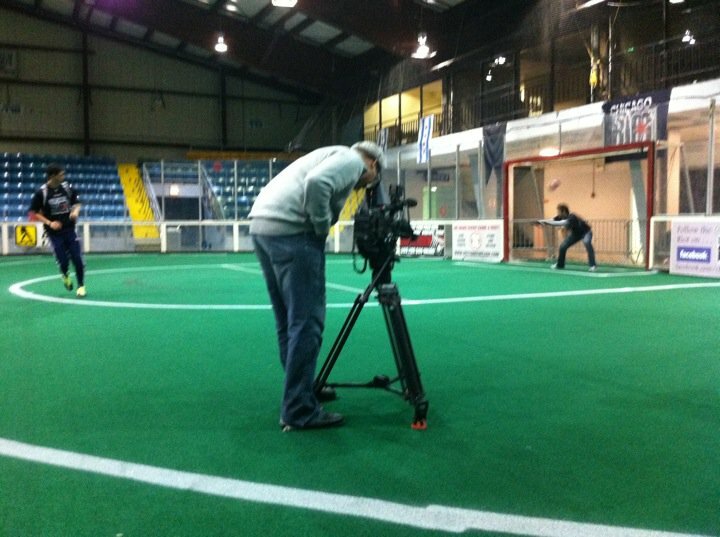 The Chicago Riot of the Major Indoor Soccer League is hosting "Chicago Soccer Heritage Night" at 7 p.m. Sunday, Jan. 30, for the team's game against the Baltimore Blast at the Odeum Sports and Expo Center in Villa Park, Ill. The night is in honor to all those who have put Chicago soccer on the map, including long-time Chicago Fire veteran C.J. Brown (pictured), who will take the ceremonial first kick as part of the rescheduled festivities from Dec. 12. "This will be a great opportunity for players and fans to reconnect, reminisce about some great memories and create new ones," said Riot Owner, President and CEO Peter Wilt. "Chicago has such a rich professional soccer history and the Riot is honored to be able to recognize some of the people who helped create it." Tickets are available starting at $10 at www.ChicagoRiotSoccer.com or by calling 630-708-6284. Read more about the festivities at ChicagoRiotSoccer.com, as plenty of former stars from the Chicago Sting, Power and other previous clubs have already committed to making an appearance. 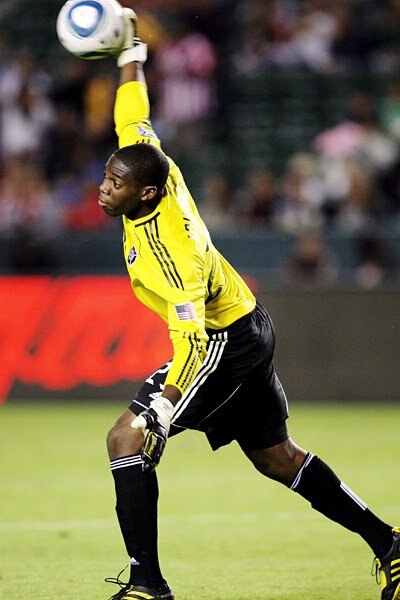 Chicago Fire goalkeeper Sean Johnson, coming off his first Major League Soccer season in 2010, begins the new year with a call-up to the U.S. National Team. Former Fire and current U.S. head coach Bob Bradley named his 24-player U.S. camp roster on Tuesday as the Americans prepare for a Jan. 22 match against Chile at The Home Depot Center in Carson, Calif. The 21-year-old Fire goalkeeper Johnson gets his first look with the U.S. squad. "The timing is right to assess many of the younger players and to broaden the player pool as we look forward to the next three years," Bradley said. Chicago Riot forward Bato Radoncic was named Major Indoor Soccer League Player of the Week on Monday, following his two-goal, one-assist effort to help lead the Riot to a 14-13 road win over the Missouri Comets on Sunday -- the Riot's first MISL victory. The Chicago Fire host Sporting Kansas City to open their 2011 home schedule at Toyota Park in Bridgeview. The game kicks off at 3 p.m. Saturday, March 26. Among the other home openers announced Monday, FC Dallas hosts the Fire on March 19, and Chicago also will take part in MLS expansion club Portland Timbers' home opener on April 14. 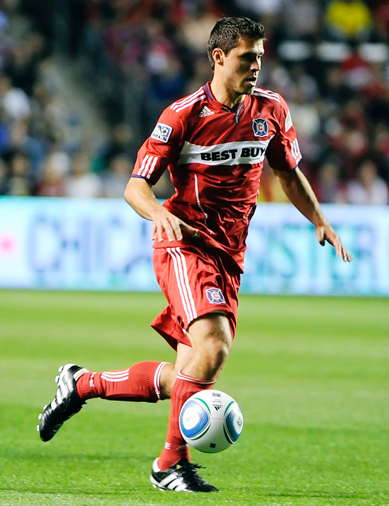 The Timbers acquired former Fire midfielder Peter Lowry (pictured) during the expansion draft. The final image of the Chicago Red Stars' 2010 Women's Professional Soccer season was the always animated Megan Rapinoe running like crazy after netting a goal during the team's home finale. I'm hopeful that is not the last snapshot of the Red Stars. The organization's ownership has given indications that it would like to return for the 2012 season, and like you, I will wait with anticipation to see how things play out. I can't help but reflect on the past two years -- one covering the team for pretty much a hobby, then having the privilege to work on the public relations side. I have not taken a single minute of my work for granted. Working in PR or covering professional soccer for a living is an absolute joy as a fan of this fine game, and the Red Stars staff, players and organization as a whole are top-notch. Those who are understandably skeptical about the "hiatus" lingo, let me just say this ... I have worked for other soccer teams that were visibly on life support, and the Red Stars do not come close to falling into this category. This team has unbridled passion. This team knows how to stretch a dollar. This team knows how to connect with fans and supporters and bring in one of WPS's higher draws in one of the most highly competitive sports markets in the country. I do not know this team's future, but if any organization could pull off a brief suspension and return, I think the Red Stars could certainly do it. I want to quickly thank the media folks who either attended the games or wrote about the team from afar. The Chicago dailies (Chicago Tribune stepped up big-time this past season), the online media (too many of you to thank individually, but Windy City Soccer was ALWAYS there), radio (WNDZ's Sportsline, and thanks to WBBM and NPR for some recognition), photographers, some TV segments away from the pitch (WGN, NBC, ABC), the great folks at Zapwater, and the other writers and bloggers out there, we've appreciated the exposure. In my cheesy and non-original way of coping with the team suspending operations, I put together some of my favorite Red Stars memories at Toyota Park over the past two years, seeing as how I had a bird's-eye view of the game from press row. 1. Cristiane's hat trick: I'm amazed even today that Cristiane is the only person in WPS's two-year history to score three goals in one game. I would have thought that the Brazilian would have some company by now. But on July 12, 2009, Red Stars fans were in for a treat as Cristiane netted a triple against FC Gold Pride -- the only hat trick in WPS to date. Cristiane's best tally for me was her final goal where she completely schooled Brandi Chastain and delivered a rocket to the far left post. I wish Cristiane had a few more big moments like that. 2. United against Gold Pride: The Red Stars' first month of the 2010 season was an all-time low -- a 1-4-1 record that led to the dismissal of Red Stars head coach Emma Hayes. It had to be a difficult moment for the players having to come back to the pitch with little time to let that soak in, while at the same time take on a Marta-led FC Gold Pride squad that had won five straight coming into the match. With the coaching search still in progress, Red Stars President and General Manager Marcia McDermott took the coaching reigns for one game on May 29, 2010, and a united Red Stars squad pieced together a victory. Kosovare Asllani netted a 55th-minute goal and a well-deserved celebration at the northeast corner of the pitch. Chicago kept Bay Area off the scoreboard the rest of the way for an exciting 1-0 win. 3. Running off into the sunset: I wish there were more people who outwardly wear their love of the game like Megan Rapinoe. Pinoe was having a tremendously difficult 2010 season. She knew it. Everyone knew it. But heading into the season finale against the Washington Freedom on Sept. 5, 2010, with nothing to play for except pride, Rapinoe tallied the second goal of the game and dashed to the Red Stars bench. Her teammates had a difficult time trying to catch up to her! That gave Chicago a 2-0 lead, and that goal proved to be incredibly important. The Freedom's Beverly Goebel tallied a goal 1 minute later, but the Red Stars held off Washington for the final minutes of stoppage time. Whew! This also marked the first run of back-to-back wins in the team's history. 4. Four scores: In the first season, the Red Stars were touted to be a favorite to compete for the first WPS title. And early on in the season, Chicago looked like it was on the right track with a 2-0-2 start. That fourth game included a dominating 4-0 victory over the Boston Breakers on April 25, 2009. Though clearly Boston did not play well, the Red Stars took advantage with four different players tallying a goal: Carli Lloyd, Megan Rapinoe, Karen Carney and the hard-nosed Brittany Klein tallied their goals in a span of just over a half hour. That was the absolute high point of the season, before the bottom fell out and the team was winless and scoreless in three straight home games in May. I prefer to forget about that massive drought. 5. Another festive finale: The Red Stars had a knack of at least closing on the right note. On Aug. 2, 2009, a record 7,959 fans came out to see Chicago's home finale against Marta and the regular-season champion Los Angeles Sol. Cristiane vs. Marta was the interesting Brazilian draw, but Marta was kept off the scoreboard as the Red Stars earned a 3-1 win. It took a second-half stoppage time goal for Cristiane to get in the scoring column. Lindsay Tarpley had a goal and assisted a long-awaited goal from Carli Lloyd, who had only two tallies on the season. Thanks Red Stars! Don't wander off too far! • Feel free to share your favorite Red Stars moment below. First road win at Saint Louis Athletica? Ella Masar's LONG-awaited first goal? Would love to hear it!